So this happened, two weeks ago now, but I am obviously awful at posting lately. I'm not going to lie, I was sort of hoping by taking the side off Callum's crib, the clouds would part, the sun would come out and he would instantly sleep perfectly. Well, that didn't happen. 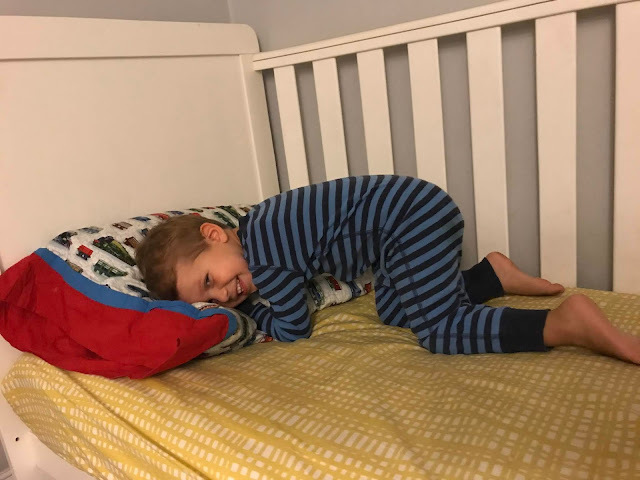 In fact, nothing has changed in his bedtime routine or sleep since doing so. Well...except when we forget to close the baby gate on his door, I am creepily awoken at 2am by a toddler excitedly staring at my face saying "I here mama! I here!" Yep, that's now happened a couple times. And honestly, I haven't decided if I prefer him calling out for us or him just coming to my bed. Obviously us going into his room and getting him back to sleep in his bed is more ideal, but throwing him into our bed with us sure is convenient. And, just to be clear, the baby gate on his room has nothing to do with keeping him in while he sleeps. It started out as giving him a safe place to play if I am taking a shower or something. But it's also convenient when he won't stop bugging his brother and sister or something as well, haha! I actually started shoving the chair that is in Callum's room up against the side of his bed so he can't roll out, but can still easily crawl out the end, as it only blocks about half or so of the side of his bed. It works well, as he hasn't fallen out of bed once. My hope is to have Callum and Connor sharing a room sometime in the next few months. 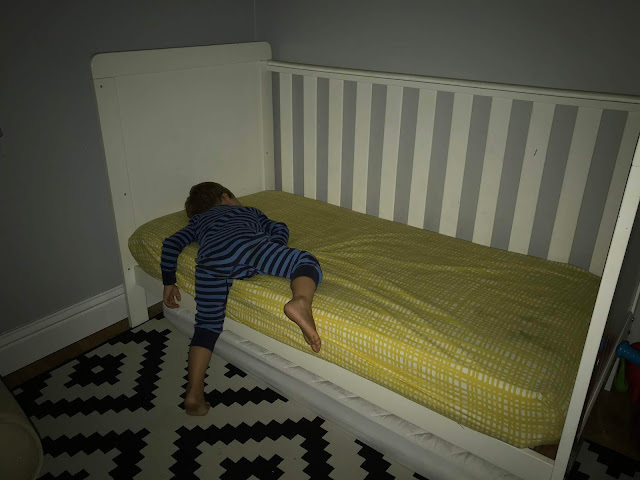 I am thinking it won't be too far off, as I've noticed Callum isn't as eager to go to sleep at night, which we've always put him in bed before the older two, but I am thinking times are a changing with that. 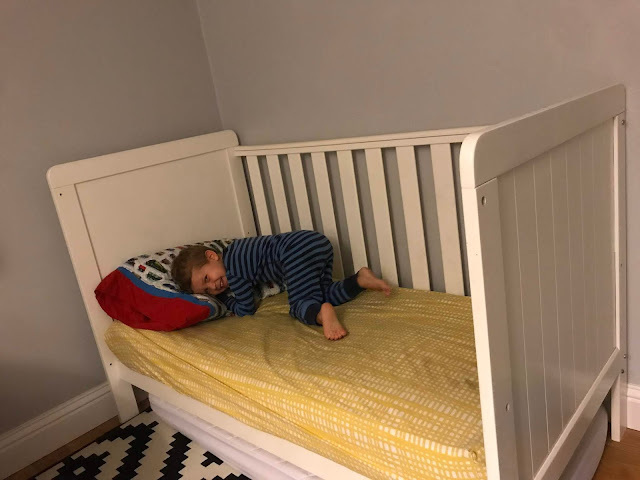 That's actually the reason I didn't switch the crib to a toddler bed (we have a footboard that makes the crib a toddler bed), as I was thinking he will be in the bunkbed with Connor soonish. We shall see.